This isn’t my work but it is a piece I want to stitch one day soon. A dear friend of mine, Michele, stitched this beautiful Melissa Shirley canvas with the inspiration of threads and stitches chosen by Brenda Hart. 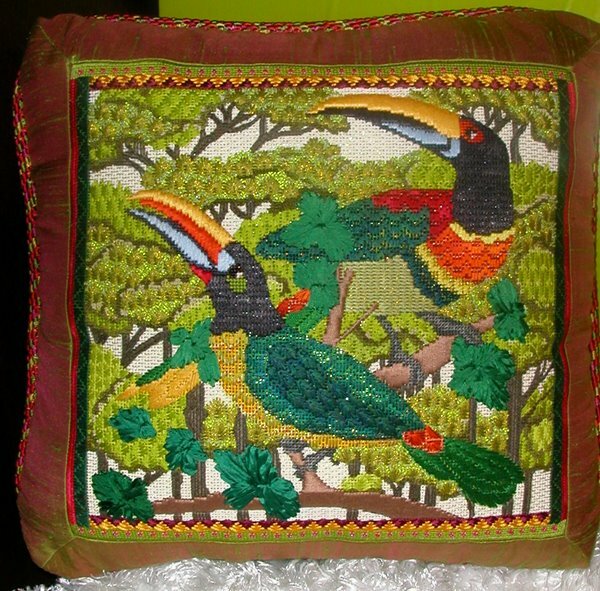 The colors are vibrant and the variety of stitches and threads brings it all to life. can you see the beads in the trees? You know I love my bling and I think that’s one of my favorite aspects of this piece. The beads add just enough sparkle to grab your eye and make you think of sun glinting through the trees. What can I say? Another project to add to my to do list. Yes, we all have a wish list of canvases we want to stitch.